The Jericho Foundation helps people to become fulfilled, skilled and employed. One of the disadvantaged groups they work with is survivors of human trafficking. This client group recently became the focus of attention, when Theresa May pledged £33m to fight modern slavery, which is a huge problem in Britain today – it is estimated that there were 13,000 people enslaved in the UK alone in 2015. Jericho is the only organisation in the UK with the expertise and resources to deliver a complete programme of work experience, training and tailored support to victims of modern slavery. This holistic help enables these survivors to end their dependency on benefits, secure sustainable employment and become an inclusive and integrated part of their local community. M* is a member of our Jericho Cleaning Team. M is a Czech national who was trafficked into the UK in 2010. After experiencing forced labour, poor living conditions, little food and frequent exploitation for over 3 years, he eventually moved into a safe house and started his journey towards independence and employment. With almost no prospects of work in the UK, M commenced volunteering with Jericho Recycling in January 2015. M started this position in the hopes of gaining more valuable work experience for his CV. M so impressed the Recycling Manager with his eagerness and hard work, that he became an employee in April of 2015. Furthermore, M has now progressed into a role as a cleaning operative in Jericho Cleaning. Initially this involved more frequent interaction with members of head office staff and M was using this as an opportunity to improve his English language and communication skills. M has now commenced his first contract with external clients and is receiving glowing feedback, he has also recently been awarded the Star of the Month in recognition of his enthusiasm, continuing high standard of industry and his commitment to self-improvement. Nigel Lawrence, Business Manager for Jericho Cleaning said “The top priority of our Jericho Cleaning social enterprise is to recruit people who have been trafficked. 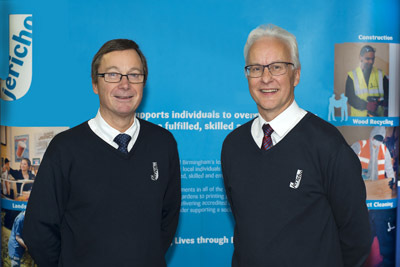 A £50k enterprise, which is rapidly growing and delivering social value in Birmingham and the surrounding areas, Jericho Cleaning sets high standards and employs those in real need. M is a lovely, hard-working man who embodies the type of individual we are proud to help. We are delighted with his success and look forward to watching him continue to blossom”. * We are not using M’s real name or photograph for reasons of confidentiality and to protect his safety. Editor’s Note: The Hockley Flyer has supported Jericho from its inception.